Drought • Students, specialists finding new ways to cut back on brown spots, gallons and costs. Al Hartmann | The Salt Lake Tribune Water management intern Joseph Hawkins adjusts sprinkler head flow at Albion Middle School in Sandy Tuesday July 21. The internships are payed through the Central Utah Water Conservency District to help make watering grounds at 15 schools in the Canyons School District more efficient and the grass healthier. Al Hartmann | The Salt Lake Tribune Water management intern Joseph Hawkins checks and adjusts sprinkler heads at Albion Middle School in Sandy Tuesday July 21. The internships are payed through the Central Utah Water Conservency District to help make watering grounds at 15 schools in the Canyons School District more efficient and the grass healthier. Al Hartmann | The Salt Lake Tribune Christopher Eppler, energy specialist with Canyons School District oversees water management interns at Albion Middle School in Sandy Tuesday July 21. The internships are payed through the Central Utah Water Conservency District to help make watering grounds at 15 schools in the Canyons School District more efficient and the grass healthier. Al Hartmann | The Salt Lake Tribune Water management interns Josh Perry, left, and Joseph Hawkins check and adjust sprinkler heads at Albion Middle School in Sandy Tuesday July 21. The internships are payed through the Central Utah Water Conservency District to help make watering grounds at 15 schools in the Canyons School District more efficient and the grass healthier. Al Hartmann | The Salt Lake Tribune Water management intern Joseph Hawkins checks and adjusts sprinkler heads at Albion Middle School in Sandy Tuesday July 21. 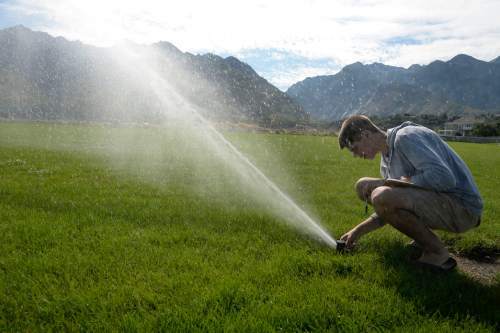 The internships are payed through the Central Utah Water Conservency District to help make watering grounds at 15 schools in the Canyons School District more efficient and the grass healthier. Al Hartmann | The Salt Lake Tribune Water management intern Joseph Hawkins checks and adjusts sprinkler heads at Albion Middle School in Sandy Tuesday July 21. 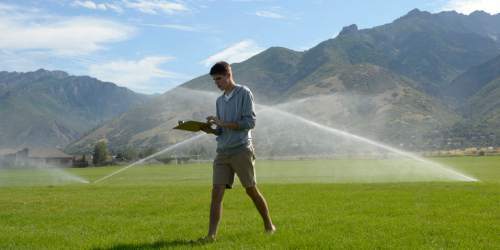 The internships are payed through the Central Utah Water Conservency District to help make watering grounds at 15 schools in the Canyons School District more efficient and the grass healthier. 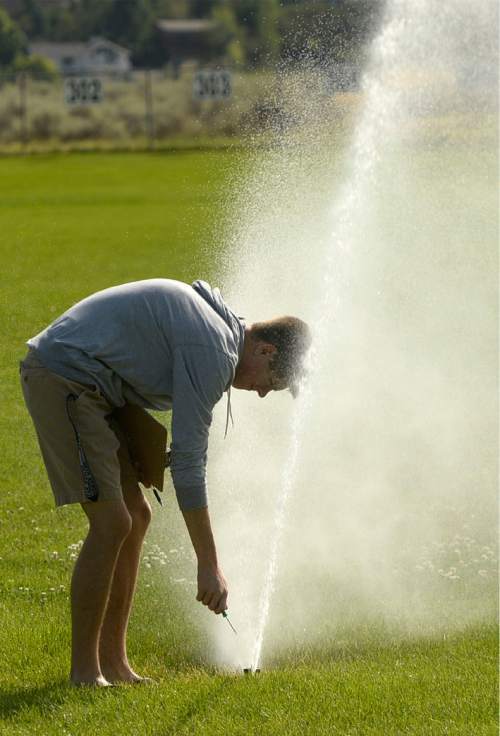 Al Hartmann | The Salt Lake Tribune Water management intern Josh Perry checks and adjusts sprinkler heads at Albion Middle School in Sandy Tuesday July 21. The internships are payed through the Central Utah Water Conservency District to help make watering grounds at 15 schools in the Canyons School District more efficient and the grass healthier. 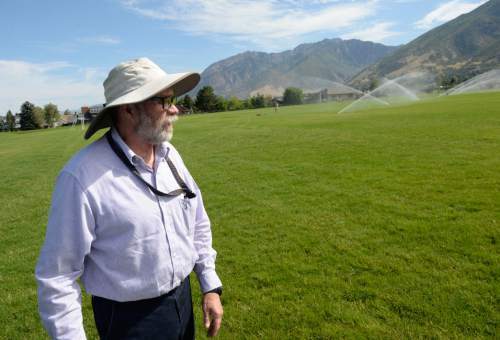 (2 column) It's not easy being green Utah school district use a lot of water to maintain fields and operate kitchens, bathrooms and drinking fountains. Here's how Salt Lake County's five school districts compare. Al Hartmann | The Salt Lake Tribune Water management intern Joseph Hawkins checks and adjusts sprinkler heads at Albion Middle School in Sandy Tuesday July 21. The internships are payed through the Central Utah Water Conservency District to help make watering grounds at 15 schools in the Canyons School District more efficient and the grass healthier. Sandy • Alta High School senior Joseph Hawkins stood with a clipboard in hand at Albion Middle School. From his vantage point on the soccer field Tuesday, he could see most of the property&apos;s sprinklers going on and off in rhythmic two-minute test cycles. Several weeks ago, Hawkins explained, the school&apos;s lawn was marked with large dry patches. But after repeated observation, adjustment and equipment repair, the grass was thriving again  despite a leaner liquid diet. "For the most part, it&apos;s greened up now," Hawkins said. "And it&apos;s using a lot less water." Water needs for a school district are significant  from the meal preparation, bathrooms and drinking fountains of the academic year to the turf maintenance during Utah&apos;s hot and dry summer months, when school fields function as de facto parks. 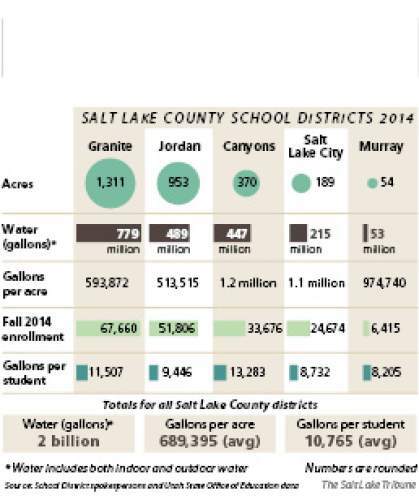 In Salt Lake County, Granite School District used more than 778 million gallons of metered water in 2014, according to district utility data. Granite is the county&apos;s largest school district, enrolling more than 67,000 students in fall 2014 and covering 1,311 acres. On the smaller side, Murray School District used more than 52 million gallons of water last year  nearly 1 million gallons for each of its 54 acres. In Canyons School District, a team of student interns  including Hawkins and six other students  work to monitor sprinkler systems and increase efficiency. The students take measurements, calculate precise irrigation cycles and check for broken or faulty sprinkler heads. And water use for Canyons is already down 35 million gallons compared with this same period last year  due largely to an unusually rainy May. Christopher Eppler, an energy specialist with the district who oversees the student interns, figures careful monitoring and system upgrades could cut the district&apos;s water bill by a fourth over the next three to five years. "We&apos;re going to start seeing savings," he said, "from August onward and into next year." Water wasters • Of the five school districts in Salt Lake County, Salt Lake City School District was fourth in total water use  215 million gallons last year  but the second thirstiest, with an average of 1.1 million gallons of water for each of its 189 acres. 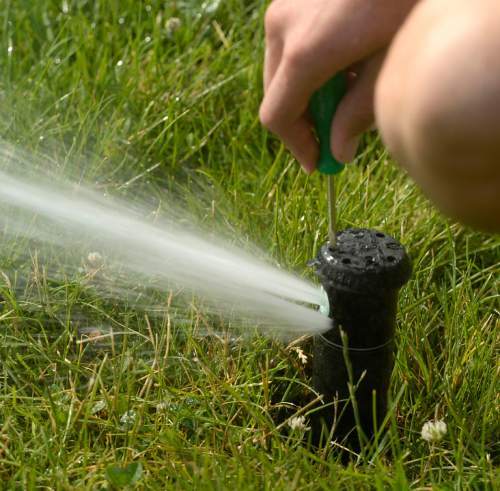 The calculation is imperfect because it doesn&apos;t try to separate out indoor water use and unirrigated areas, but Salt Lake City auxiliary services Executive Director Paul Schulte said he wasn&apos;t surprised by the district&apos;s comparably high acreage numbers. Newer schools are often built in large, open spaces, he said, but Salt Lake City&apos;s school properties are shaped inconveniently for sprinkling systems, resulting in excess water on sidewalks, roadways and parking lots. "Because we&apos;re landlocked," Schulte said, "you&apos;re going to find a little bit more waste." He said the district is in the process of installing fully automated sprinkler systems that calculate for precipitation, humidity and air temperature for more efficient irrigation cycles. Automated irrigation is particularly valuable in a year such as 2015, Schulte said, when a wet May was followed by a hot June and a relatively cool July. "It&apos;s like the poster child," he said, "for why you should have these systems in place." May of this year tied for the sixth-wettest May in Utah history, according to Lisa Verzella, a meteorologist with the National Weather Service. Those rains gave a welcome boost to reservoirs, she said, which helped mitigate the June heat wave. "May was a huge month for us," Verzella said. "Now we are kind of going back to what looks like a fairly normal pattern." Last month, Utah Gov. Gary Herbert issued an executive order instructing state agencies to avoid irrigation between 10 a.m. and 6 p.m., when high temperatures evaporate sprinkler water. But eagle-eyed Utahns have turned to social media to call out so-called "water wasters," including public schools. Alex Cragun, creator of the SLC Water Wasters Facebook page, said poor school irrigation is doubly wasteful, drying up both water and taxpayer dollars. "School districts should lead by example," he said, "and not only practice conservation of water, but teach it to the future generation." Utah Rivers Council Executive Director Zach Frankel acknowledges the size and use of school grounds present maintenance challenges. But he added that he regularly sees school lawns being watered during rainstorms, or sprinklers dumping water onto concrete and asphalt. "It&apos;s clear that the schools in general across the valley are not doing a great job conserving water," he said. "They are some of the biggest wasters that we see." 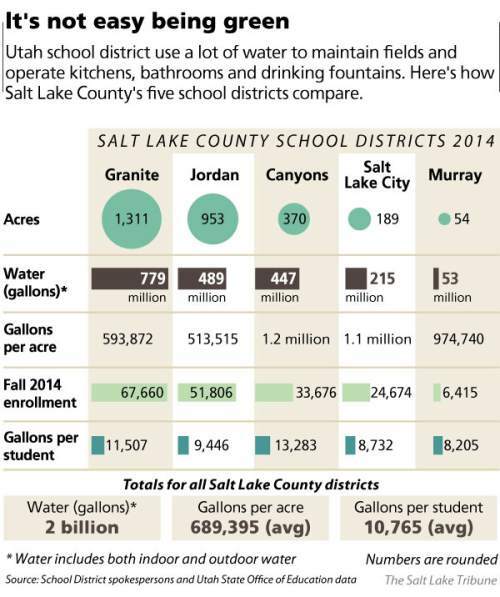 In Salt Lake City, school water use is down 10 million gallons compared with the same period last year. And Schulte said the district&apos;s water consumption is a reasonable amount to provide a positive learning environment for students and fields for sports leagues and community recreation in the summer. "You have a resource here that should be available to the community year-round to enhance their lives," he said. "We&apos;re being conscientious. I think it&apos;s on everybody&apos;s radar to conserve." Every little bit helps • Granite School District&apos;s water use is the inverse of Salt Lake City  high on total gallons but low on a per-acre basis. Some Granite properties are irrigated with unmetered secondary water, which are not included in the district total. Don Adams, Granite&apos;s assistant superintendent over support services, said roughly 86 percent of district schools are on automated sprinkler systems. Those systems include rain gauges that turn off the faucets during and after a storm, he said. "We want to take advantage of that rain as much as we can." Adams said district custodial staffers routinely test the system for leaks and faulty equipment. But, he added, residents who see wasteful irrigation should continue to report it to administrators, since every dollar that goes into the ground is one that could have been used in the classroom. "Being frugal," he said, "is important to the district in whatever way that is." For large school districts, monthly water bills can run in the hundreds of thousands of dollars, and conservation efforts can pay large dividends. During 2014, Jordan School District paid $1.3 million for its 489 million gallons of metered water, according to Duane Devey, the district&apos;s director of custodial and energy services. In the past, Devey said, school custodians manually would plug in a wheelbarrow full of sprinkler heads and let them run all night. Now, with automated systems, zone irrigation and water-wise xeriscaping, he said, schools are always finding ways to be more efficient. So far in 2015, Jordan School District has used 71 million fewer gallons than the same period last year, according to Devey. That decreased use equates to more than $114,000 in cost savings for the district. And conservation efforts extend beyond water use, Devey said. During the past 11 months, custodial staffers have made $600,000 in utility- efficiency improvements. "For some reason, we don&apos;t do a very good job of turning things off at night," he said. "We find a lot of little things we can do better at." Teaching conservation • The student internship program at Canyons School District was started with a $15,000 grant from the Central Utah Water Conservancy District, but Eppler said the savings from decreased water use will more than match that initial seed funding. As for the students, their summer jobs have turned into that learning experience Cragun urges. Hawkins said his parents already have put him to work adjusting the family&apos;s irrigation schedules at home, and he has learned a few tips for residential water users. "A lot of people like to water all at once," he said. "Give it the water it needs and don&apos;t overload it." Morgan Nelson, a junior at Alta High who works in the internship program, said checking school irrigation systems is good summer work. But she added that her irrigation expertise is left behind when she heads home at night. "I avoid sprinklers after work," she said. "I&apos;m done with them." Utah school district use a lot of water to maintain fields and operate kitchens, bathrooms and drinking fountains. Here&apos;s how Salt Lake County&apos;s five school districts compare.